Let’s travel is a travel agency in Santa Monica. 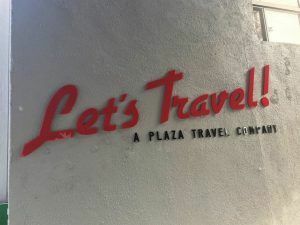 In 2008, they merged and became a division of Plaza Travel in Encino, California. Their existing signs had been up for a while and were out of date. They reached out to us for a few new building signs with their updated logo to make sure that people would be able to see their location. 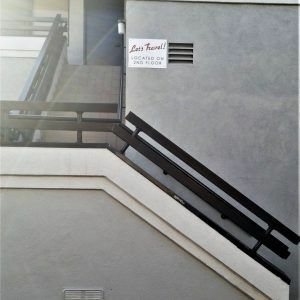 They’re located on the second floor and a tree is located right in front of their sign location so they wanted to make sure that their new sign stood out. Their existing sign had an outdated logo and the colors weren’t too noticeable so their new, red letters are much better for attracting new customers. Although their main sign is in the front, the entrance to the business is through the rear parking lot so they wanted to put a sign there also. They had one previously, but it had blown off in the wind so they wanted to replace it with a new one that would be more secure. The building is shared by many different businesses so their sign space is limited. In cases like this, you need to make the most of what you have to work with to make sure that your business is getting optimal advertising. Although many people would find a travel agency online, it’s still important to make sure that customers can find your location when they need to find your office in person. Even with the help of current technology and navigation, signs are the main way that people find where they need to go. With a logo sign out front and a direction sign in the rear, customers will be able to find the office and understand where they need to go right away with the sign near the stairs directing Let’s Travel customers to the second floor.